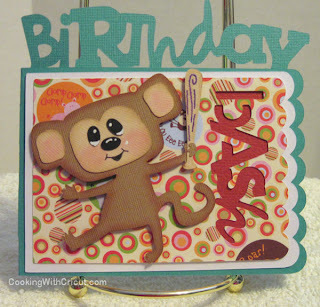 My Paper Crafting.com: Melin & Jen Are Monkeying Around! 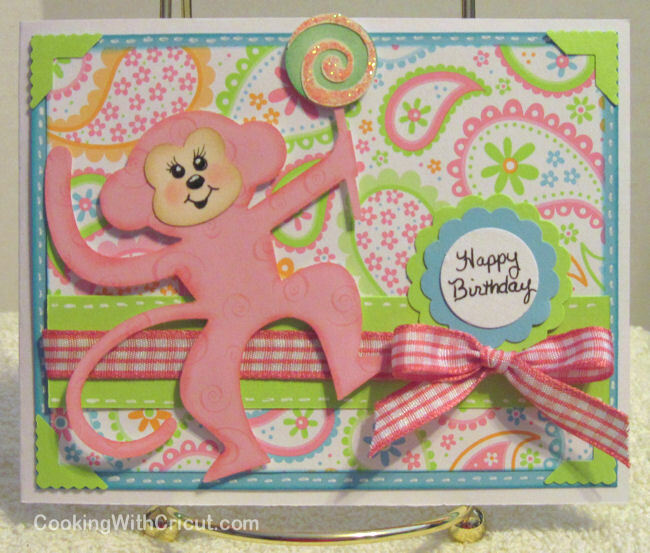 Melin & Jen Are Monkeying Around! It's just another Monkey Monday . . . no Cartridge Showcase today . . . just Melin and Jen monkeying around! We decided to collaborate and bring you some fun projects with a "monkey" twist. One of Jen's nephews just turned one and his mommy always calls him her" little monkey." So a monkey party was an obvious choice! Did you know that there are monkeys on 17 different Cricut cartridges? So many to choose from . 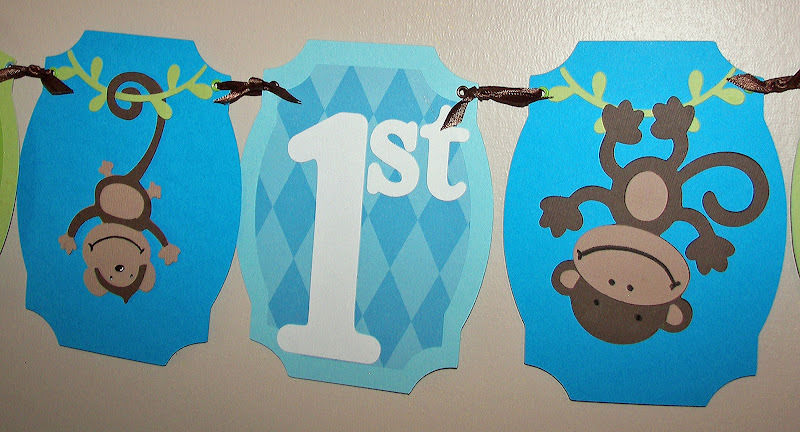 . .
Jen used monkeys from Create-A-Critter, New Arrival and ZooBalloo for her banner, party decorations and cake. and the monkey on the right is from New Arrival. 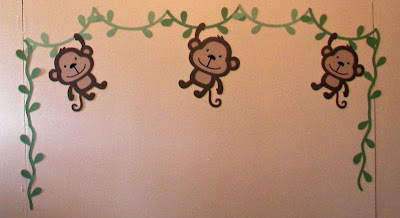 These little monkeys and vines are from the Create-A-Critter cartridge. Jen used her Cricut Cake to cut the fondant decorations for the cake. 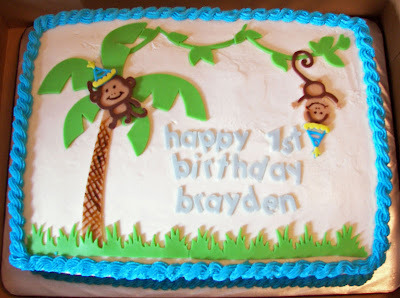 The monkey on the left and the palm tree are from Create-A-Critter. The monkey on the right, grass, vines and party hats are from ZooBalloo. The text was cut using the Mickey Font cartridge. Isn't this little monkey "smash" cake the cutest thing ever!!! and the stars are from Plantin SchoolBook. 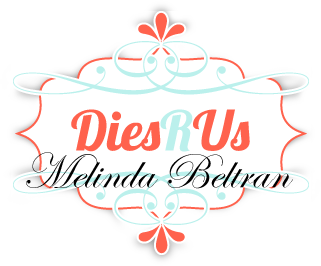 For more details on sizes and the papers Jen used visit her blog. 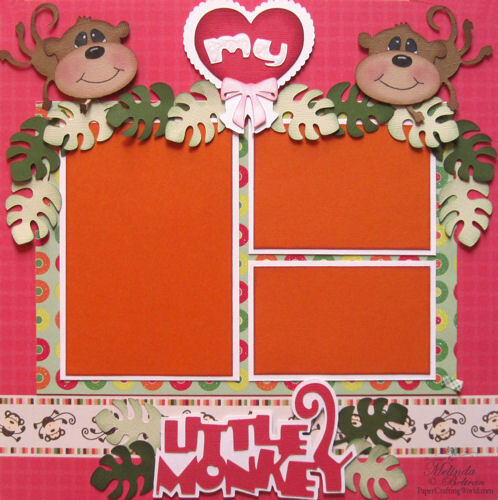 Melin created this layout using the sweet little monkeys from the Sweethearts cartridge. 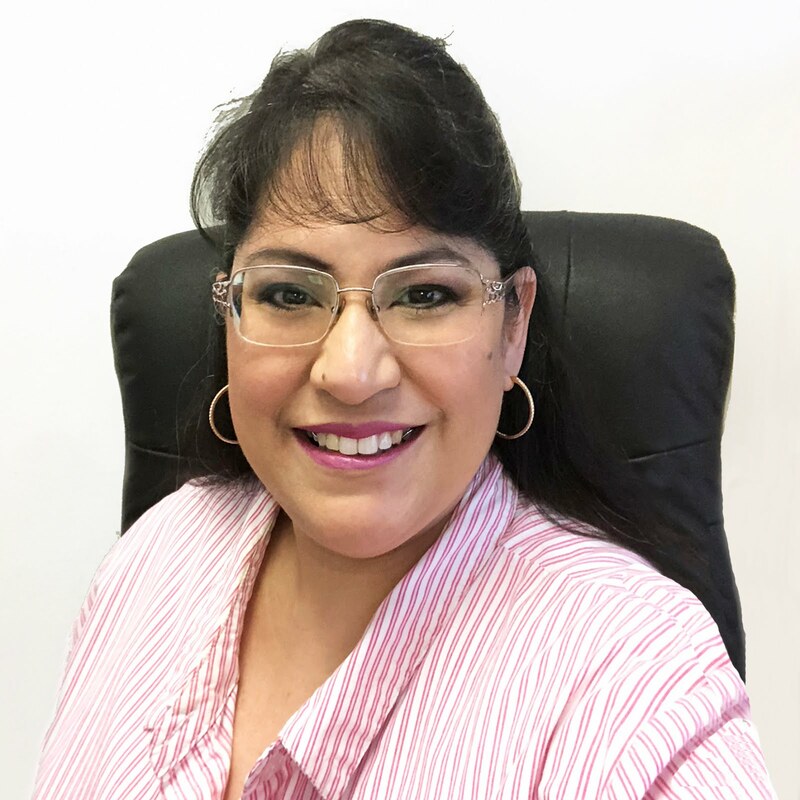 She used the "flip" feature on her Expression to create the mirror images. Here is a close up of the cute little title. 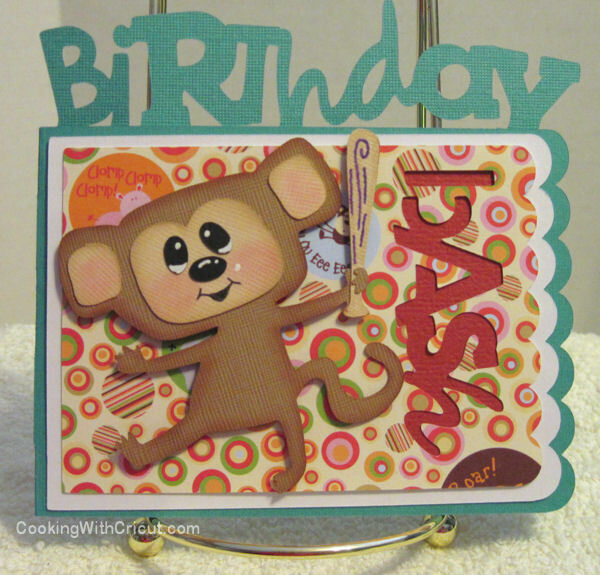 Melin created this adorable birthday card using the Birthday Bash Cartridge. She also used her Gypsy to "weld" the face pieces together. 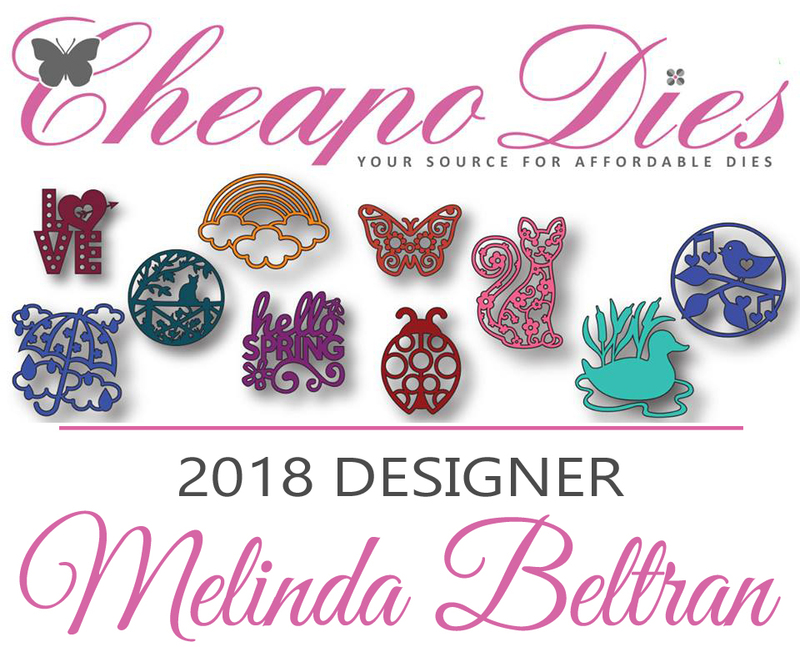 The smaller the "Cricut" faces, the less appealing they are to Melin, so she will use her Gypsy to "hide contours" and add her own eyes and nose. Just find an oval or circle on the same cartridge you are using and re-size it make your eyes and nose fit your face....easy peasy! 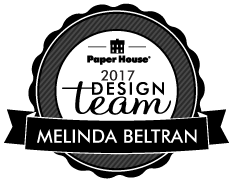 Last but not least, Melin created this card using the Paisley Cartridge. She also used her Gypsy to "Hide Contours" for all the monkey's body pieces and face. She used a couple of EK Scallop punches and a circle punch to add the sentiment. 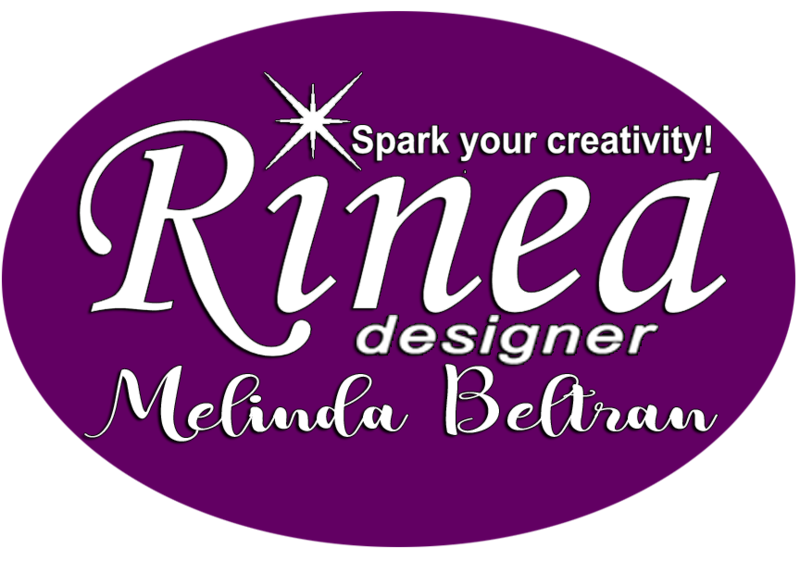 Thank you so much for taking some of you crafty time to join us today! 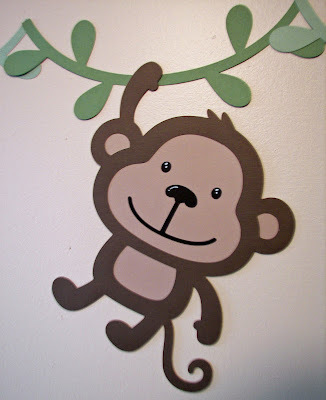 Be sure to do a little "Monkeying Around" yourself and create, create, create! Join us tomorrow as we have another great post with more inspiration from our PCW girls!!! Looks like you two had some fun monkeying around! These are just the cutest creations EVER. Jen, you should definitely open a party planning business - you'd be swamped with requests. 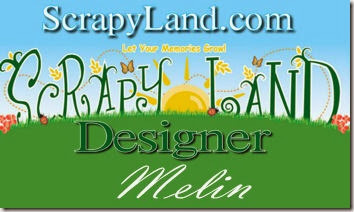 Melin, the layouts are fantastic. 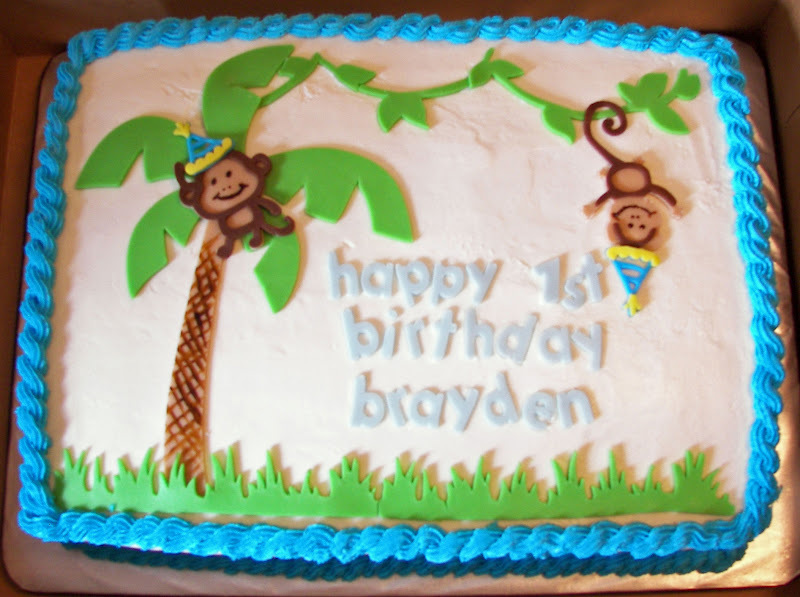 I love that you used hide contour with the Paisley monkey - I wasn't crazy about the layers, but your monkey is now nothing but cuteness. Great job ladies!! Wow so many monkeys and so little time. You did a great job showcasing some great ideas. Thanks for the inspiration. 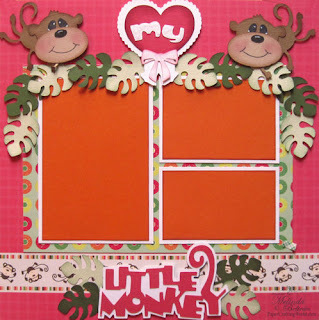 Great job showcasing the cute monkeys! Love the projects! Melin, love the faces! 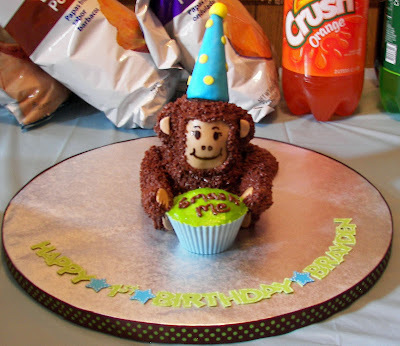 Jen, great party creations -- love the monkey cake! One of the est posts ever!! I love Monkeys so very very fun. What a cute post, you two seem to have so much fun together. Love all the projects as always. So much cuteness:) Love this post!!! Awesome job ladies. So cute! I love monkeys and you guys made me love them more! TFS. Wow, you ladies did a fabulous job!!! What a super fun set of party decorations. I love this little monkey! this is just about my favorite thing EVER that I have seen on any blog! Wow! you two really out did yourseves on this monkey stuff. I just LOVE it!! Jen, I sent you an email with my photo attached. I am here at school where I cannot get on FB. They have it blocked. And AT&T is sending me a new modem. Mine stopped working Sunday night. So no internet for me at home until new one arrives. AT&T says I should have it Thursday. If there is any thing from the FB page I need to know, please email me. And when I am at school I wik check the email. On January 26, 2012, you posted a flower topiary, that you said you had used the Straight From The Nest cartridge, Is it possible to tell me which page and size that you used to cut the flowers from.